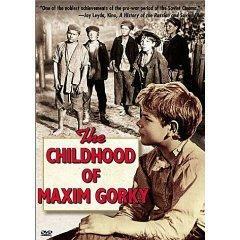 The Childhood of Maxim Gorky (Detstvo Gorkogo) was released in 1938, Gorky (whose real name was Peshkov), the man on whose life (and books) the film is based died two years earlier. The Childhood of Maxim Gorky is the first of a trilogy (the other two titles are My Apprenticeships, & My Universities) all directed by Mark Donskoi and adapted from Gorky’s autobiography. These three films are all from Russico, and apparently all three were available at one time with English subtitles, but so far I’ve only been able to find the other two films in Russian only. The film is set in the 19th century and begins with the arrival of Aleksei Peshkov (Aleksei Lyarsky) and his mother by boat to join his mother’s family. Although it’s not expressed, the idea is present that Aleksei and his mother Varvara Peshkova (Yelizaveta Alekseyeva) have returned to her family due to harsh necessity. It seems that Aleksei’s father was not popular with Varvara’s irascible contentious father, Vasili Kashrin (Mikhail Troyanovsky), but Aleksei’s father is now dead. Structurally, the film follows Aleksei’s early life concentrating on the people and incidents that influenced him. Varvara and her son Aleksei return to a viper’s nest. The problems within the family are glaringly apparent, and most of the squabbles arise over the question of inheritance and how the family dye business will be divvied up among the three children. Aleksei’s two uncles engage in endless battles of recrimination, but they shelve their quarrels for the most part in the presence of their domineering father. The uncles, Mishka and Yashka (Aleksandr Zhukov & Vasili Novikov) are unpleasant and stupid, and according to the grandfather, when they inherit they “will squander everything on drink.” Given the few scenes involving the uncles, there’s not much reason to argue with the grandfather’s assessment, and in some ways this pathological family situation is very stereotypical. The grandmother (Varvara Massalitinova) is viewed as indulgent, excusing her sons’ behaviour and pestering the grandfather to share the inheritance while he is still alive (reminds me of Zola’s The Earth), and of course, the grandfather reacts by arguing that his wife coddles the sons and has made them into loafers. Basically the family members are at each other’s throats for a battle over the limited resources. A major influence on Aleksei is his wonderful grandmother, an avid storyteller, a woman who loves her home and her family and suffers mistreatment & beatings from her husband. The grandmother is obviously the glue that holds the family together, but when adversity strikes, even she cannot fix the situation, and Aleksei lives with his grandparents, moving and sinking farther and farther into poverty. Living with his grandparents, but left more to less to his own devices, Aleksei learns to scavenge to earn enough kopecks for food. As their fortunes decline, Aleksei’s grandfather, who is apparently not the most stable of men, vacillates between petty childish tantrums and vicious attacks on his family. Various animals appear throughout the film, and clearly they have an important role in Gorky’s life. The film includes moments of whimsy in its depiction of Aleksei running wild in the streets and fields with a band of equally wretched boys (see the DVD cover). But underneath these sentimental touches, there’s the clear message that all these poor people have are their bodies and their ability to labour. There is no social structure to buoy up the blind, the elderly, or the infirm, and those who cannot work must beg for a living or starve. The grandfather recalls how he pulled barges for a living, but in the grandfather’s case, adversity makes him meaner and less likely to share a crust of bread with a passing beggar. The film does not touch on the upper classes but stays firmly with the peasants. Gorky, a founder of Socialist Realism, is a problematic figure in the history of Russian literature. I don’t want to spend a great deal of time on Gorky’s politics–although it seems impossible to review the film and not mention Gorky’s position in both Tsarist Russia and Stalin’s Soviet Union. At first a supporter of the Revolution, Gorky became disillusioned, as many did, with the outrages of the Bolsheviks. Censored under the Tsar, Gorky found himself censored under the Bolsheviks too. Gorky lived abroad for some years but then returned to the Soviet Union at the personal invitation of Stalin. There are photos of Gorky and Stalin together, and I know I wouldn’t want my mug to go down in history next to Stalin’s. Gorky was given a mansion and a dacha by Stalin, but by 1934 he was back under house arrest. I’ll admit that one of the reasons I didn’t watch the film earlier is because I connect Gorky with Stalinist propaganda. Gorky knew what was happening in the Soviet Union; he knew that writers, such as Gumilyov were being executed, so Gorky didn’t even have the excuse of ignorance when he returned and effectively endorsed the Stalinist regime. No matter what Gorky’s motives were in returning to Stalinist Russia, his legacy to Russian literature suffered as a result. Many Russian emigre writers suffered in exile and many poets and writers were slaughtered in Stalinist times. My sympathies are with them. At the same time, to wipe out The Childhood of Maxim Gorky as pure propaganda seems nonsensical. This was Gorky’s childhood, and his childhood mirrored the lives of millions of Russians who depended on their health and their strength to eke out a living. The quantification of humans into the volume of labour they can produce is horrifying (makes me think of factory farming). Watching the film brings to the fore the tremendous waste of human potential under such a system. And of course that brings us back to the idea of revolution….